An (Islamic) terror attack in Istanbul, Turkey. 1. Pallas semisquare Pluto and ruled by Saturn which is parallel Pluto. 2. Second House ruled by Mars which is conjunct South Node. This is a weak expression of the formula -- not a lot of concurrent violence elsewhere. 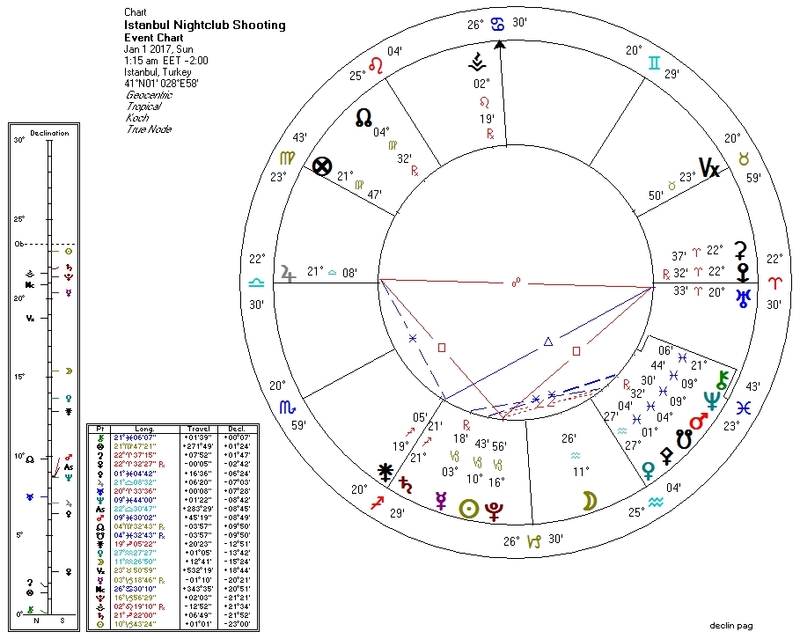 The chart of Turkey is under a lingering Pluto-to-Pallas transit which has been fostering bad behavior in recent years there. I plan to analyze an alternate chart for Islam to the one I've been using. The one I've been using does not quite account for the body count we've been seeing from the "Religion of Peace".